What Materials Are HVAC Ducts Made From? Duct board is a great alternative for home heating systems. Duct board has many advantages compared to its metal duct counterpart. One great advantage is when the HVAC system kicks on, you won't hear the "pop" or "ping" sound that you can hear with a metal duct HVAC system. This sound is caused by the rapidly expanding duct as the air moves into it. Duct board can absorb this pressure easier. The other great advantage is that its already insulated. 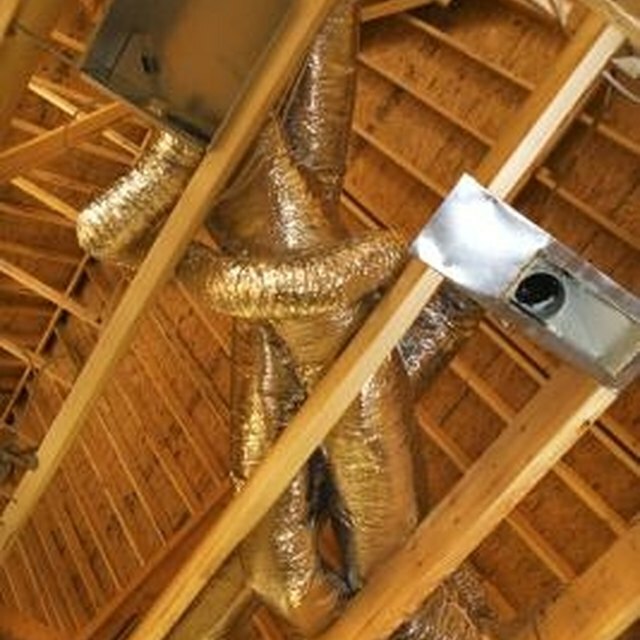 Lastly, it's easy to install duct board compared to metal ducts. Lay out where the duct board will be installed and ensure you have all the appropriate duct sizes, elbows, transitions, and other fittings. Start joining the first two duct board joints. Duct board has male and female ends on each joint. Slit all four corners of foil on the male end. Don't cut below the edge of the male end and don't cut into the duct itself. Push the female end of one joint into the male end of the joint that you slit the corners. Make sure they are fitted tightly together. Staple the foil flaps on to the duct board joint you slid on with 1/2 inch staples. Put a staple about every 2 inches. Seal the joints together with 2 1/2 or 3 inch pressure sensitive aluminum foil tape. Press it tight to ensure a sealed fit. Support your duct board from structural members using 12 gauge wire and 1 inch by 1 1/2 inch by 1 inch channel. You'll be making a trapeze hanger where there will be a wire running up to the structural members on each side of the duct. The wires will tie to the channel which will sit underneath the duct. Ensure duct is level when hanging it. Continue installing and supporting your duct board as outlined in steps 3 and 4 until the entire duct system is installed. Install hangers on 12 foot centers for duct that is under 12 inches deep, and on 8 foot centers for duct that is 12 inches deep and over. Cut in your round duct collars and run your metal round duct to your register boots. The amount of these and lengths will depend on how your individual system is designed. Duct board needs to be clean from dirt and debris when sealing with pressure sensitive tape. If not, the tape could eventually come off which will allow the duct work to come apart. When working with duct board, always wear a dust mask. The fiberglass which makes up the duct board can become air borne and get in your lungs.